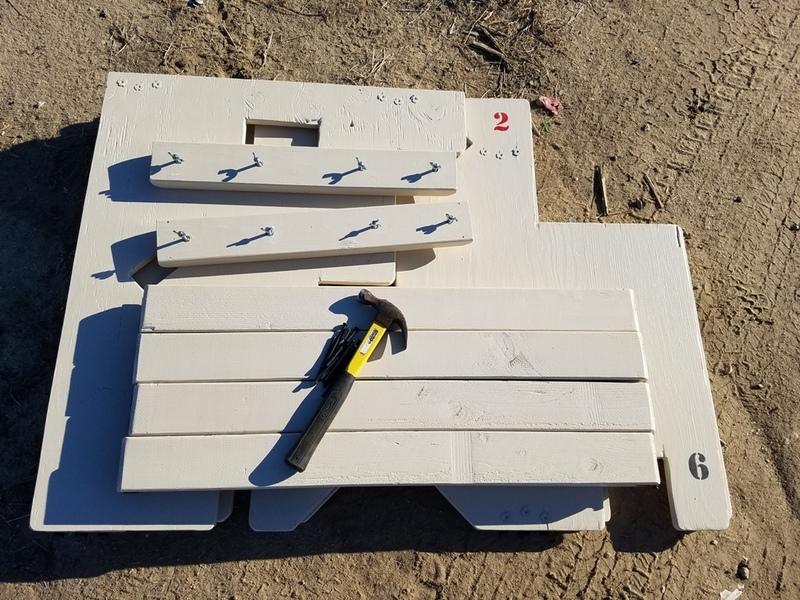 How to Build a Compact, Portable Range Barricade- Part 1, by I.S. Training is paramount, and how you train determines how you will respond in situations. 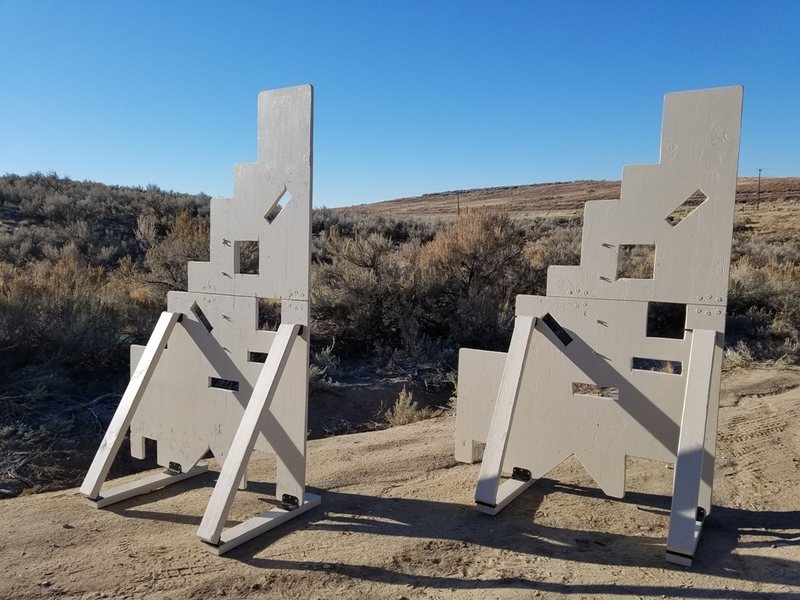 For many of us, the limit of our firearms training has been on a “square range” (i.e., shooting bench and paper targets down range). However, limiting your training to that artificial realm will set you up for failure when things go wrong. Effective training will teach you the fundamentals of shooting, movement, and communication. Learning how to effectively use and shoot from behind cover, in a variety of positions, is a critical part of this training. A range barricade is useful for this purpose. Few of us have the room to set up a shooting range on our property. Therefore, a plan was born to create a helpful “trunk range”. The plan called for one that could be transported in the trunk and backseat of a sedan or SUV and quickly set up on an appropriate venue and included target stands, steel targets, and training barricades modeled after VTAC’s classic barricade and FrontSight’s “Wilson Wall”. This article will describe how to build a compact (folds up to a 4’x3’ travel size), portable (setup or takedown in a couple minutes) range barricade. 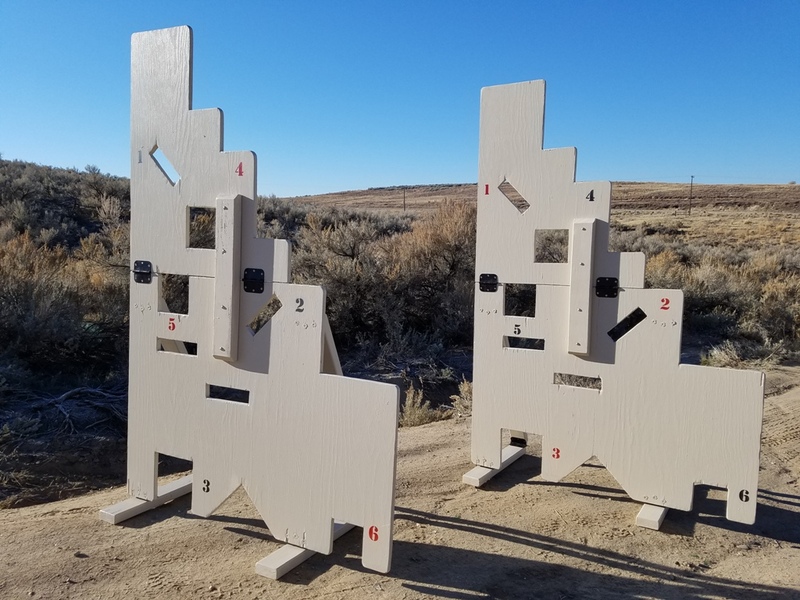 While based off the VTAC barricade, of which plans and write-ups are available online, I have not seen anyone use hinges to create a strong and easy-to-transport design like this. If space is not a constraint, you can skip the folding upper portion of this design. The materials and instructions refer to this as “without the folding option”. Construction takes approximately four hours, costs run less than $100 in 2018, and the materials listed will build two complete barricades. If you are unable to haul a 4×8 sheet of plywood home from the store, by reducing the overall height from 6’ to 5’ on the barricade, you can have the plywood ripped down at the store to more manageable 4×3 and 2×3 sections – all transportable in most sedans. Likewise, the three 8’ long 2x4s can be cut down into the appropriate lengths prior to transport. Finally, I am assuming the builder and shooter will exhibit common sense safety measures both in construction and use, including the wearing of eye and ear protection, following firearm safety rules, et cetera. I’ve tried to be as understandable as possible in these instructions and plans. Please reference the pictures if anything is unclear. 4’x8’ sheet of plywood, ~3/4” thickness recommended. (A prototype was built out of 3/8” plywood to test, but it was too flexible to be effectively braced against, and the weight and cost savings was not enough to justify it). 23/32 plywood will run you $34-45, depending on grade from a big box store. 16 standard door hinges (though only 12 are required without the folding option) and standard wood screws (#9×1/2 and which are typically included with the hinges). The dimensions are based upon a typical interior door hinge with a 1/4″ pin and both leaves half swaged. If you use something else, be aware the hinge placement dimensions will be ever so slightly different! I was able to buy an 18-pack of hinges on Amazon for $25. For assembly, you will need to separate each hinge leaf by removing the hinge pin. For these hinges, one side has three knuckles (referred to as Leaf A); the other side has two knuckles (Leaf B). There are only eight main steps to completing the portable barricade (and only six if it is not folding). Gather your materials and tools and begin. For step #1, use your tape measure and edges to mark the stepped shape of the barricades onto your plywood, referencing the plans. Then, cut plywood into two identical barricades. The final size will be 4’ wide by 6’ tall. If you need to transport smaller pieces of plywood home to use, have the 4×8 plywood ripped into two 4×3 sections and one 4×2 section. You will lose the top 12”x12” portion of the barricade by doing this, giving you only a 5’ tall final height. Once home, mark and cut the barricade shapes. To cut the steps with a jig saw, drill a 3/8” or 1/2″ hole at the corner. You will use this hole to begin cutting with your jigsaw. It’s recommended you chamfer all outside sharp corners with your skill saw. Then, sand all edges. Step #2 involves marking the cutouts on plywood and then cutting, using your jig saw. (Drill a hole in the corners first and then use your jig saw to begin your cutting outward from the hole.) Note: Cutout sizes and locations are merely suggestions. Feel free to modify, but be aware of interfering with the leg attachment and folding hinges/support. Additionally, you will sand all edges of the cutouts. Step #4 is to attach hinges to the supporting 2x4s. Each of the four 36” long supports has a “B” hinge leaf (two knuckles) attached to either end, on the same side. Place the hinge leaf at the end of the board, mark the screw holes, drill 1/8” pilot holes, and then screw the leaf in place. Then, repeat this process on the other end. Step #5, like #4, is to attach hinges, but this time you attach them to the bottom feet 2x4s. Four of the 24” long 2x4s will be the bottom feet. On one end of each leg, attach an “A” hinge leaf (three knuckles). Place your leaf, mark, and drill 1/8” pilot holes. Hold off on installing the hinge until you complete the following action. From the end of the 2×4 where you will install your hinge leaf from the previous step, measure 15-1/2” and mark a line. Place a “B” (two knuckles) hinge leaf at this line, mark, and then drill pilot holes. 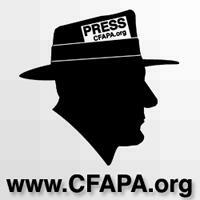 (See picture.) You install both hinge leafs onto each leg in the pilot holes you have drilled– “A” on the end and “B” about three quarters of the way along the leg. Tomorrow, I will walk you through the final steps plus give you some tips on using the barricade. Excellent idea. I have limited space but that concept will work well in the space I have. Also the laser targets and others of such design would be easy to incorporate plus they can be changed to add the element of surprise.